A highlight of our Cognac Tour is a visit to the frigate Hermione moored in the port city of Rochefort. 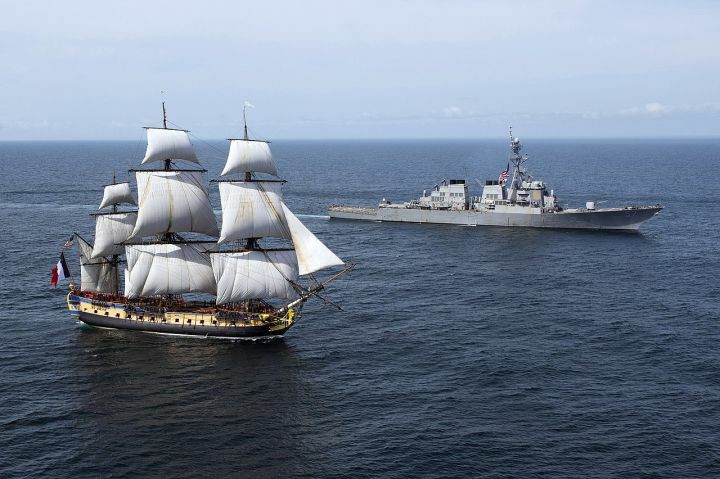 Hermione is famous as being the ship that carried General La Fayette to bring news to Washington that the French were willing to send much needed reinforcements, both troops and naval forces. General La Fayette embarked at Rochefort on 11 March 1780 and arrived in Boston on 28 April carrying the secret news that he had secured French reinforcements (5,500 men and five frigates) for George Washington. After the dramatic failure of the Penobscot Expedition, a large military expedition to dislodge the British from their new stronghold at the confluence of the Bagaduce and the Penobscot River on the east bank of Penobscot Bay in Maine (an area later known as Castine), the revolutionary council of Massachusetts asked Latouche if he would be willing to sail to Penobscot Bay for a quick military intelligence-gathering cruise, checking on the strength of the British garrison at Fort George. Hermione then made the week-long voyage in mid-May, after which the frigate sailed to Rhode Island. Next, she got underway again on 2 June and suffered serious damage in the fierce action of 7 June 1780 against the 32-gun HMS Iris, under James Hawker. After the end of the American Revolutionary War, Hermione returned to France in February 1782. She ran aground and was wrecked after distinguished service in 1793. In 1992 a project was conceived by members of the Centre International de la Mer ito build an accurate replica of l'Hermione. Construction began in 1997, envisaging a launch in April 2015 (as compared to the original, which took less than a year to build). The shipyard was in one of the two dry docks beside the Corderie Royale at Rochefort. As far as possible, traditional construction methods were employed. English plans of a sister ship, Concorde, were used. The cost was estimated to be $22 million. The original plans had been modified in several ways for reasons of strength and safety: planks had been bolted rather than pegged to avoid movement during the long period of construction. Hemp rigging was used, and the sails made of linen. After completion, Hermione completed a transatlantic crossing which was intended to signify the ties between France and the USA. To see the full details of our Cognac tour which includes a visit to a prestigious Cognac distillery and a crossing on the Unesco listed transporter bridge across the Charente, and the wonderful historic port of La Rochelle, click here!